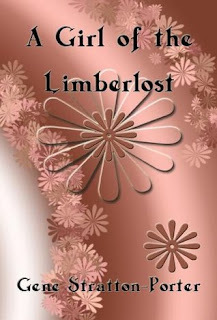 We read A Girl of the Limberlost for Book Club this month. 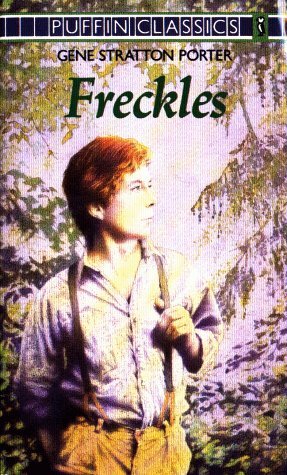 I had a copy of Freckles, so I read that one as well. Of the two, Freckles comes first. 4 stars: Heroes to cheer for and villians to hiss at! Freckles is a foundling with just one hand, who has escaped an abusive foster father to strike out on his own. He comes to McLean's logging camp, frail, starving, desperate for work. McLean gives him a job as guard for 2000 acres of valuable timber in the Limberlost--a section of swamp and forest full of animal life. He has to walk the line--a 7-mile circumference of barbed-wire fence around the perimeter twice each day. Even though he is a city boy and not used to so much activity, he is utterly determined to succeed at his task and prove himself worthy of McLean's trust. It helps that he's staying with a couple who treat him like a son, with plenty of good food, warmth, and kindness. Over the course of his year, he goes from absolute terror and jumpiness at every sound to loving the Limberlost and all its denizens. He particularly loves the birds and takes delight in finding out about them. Then a marvelous girl comes along--he calls her the Swamp Angel--and his world is transformed. This was an inspiring book. Freckles was a hero! McLean and the Duncans were just as good, loving Freckles and taking care of him when he needed it so badly. My only hesitation in handing it to my kids is that you have to wade through quite a bit of brogue in some places--written out, so that you have to almost speak it to understand what the characters are saying. I don't think they would stick with it through those parts. Maybe I could find an abridged version though, that would be easier to read. 4 stars: A girl who succeeds and finds happiness against all odds! Elnora is determined to go to high school, even though her mother mocks her and refuses to help her, and she knows that she will stick out like a sore thumb. She doesn't have the right clothes, the right kind of lunch box, and worst of all--she thought books were provided, but she's going to have to buy them herself. The money required might as well be a fortune, for how difficult it will be for her to obtain. Then she sees a sign that will become her salvation: the Bird Woman will pay for specimens of moths, butterflies, cocoons, and more. Elnora has been collecting things from the Limberlost swamp for years. As she presents her specimens and receives payment for them, it would seem that all hurdles are past for the present. Of course, that is not how life really works. She still has troubles to pass through, big and small, as she perseveres in her dream to get her education. However, the further she goes along, the more allies she finds to help and support her, until one day even her mother may be included in that number. It has been such a long time since I read this! I remember loving it as a girl. This time through I was struck by the way the characters grow and change. Elnora's mother, in particular, was fascinating to me. The interactions between the neighbors--the Sintons--and Elnora's mother were pitch perfect. Elnora is another character of Porter's to emulate. Somehow retaining a tender heart, despite rough treatment from her mother most of her life, then being able to forgive her mother after all that and build a beautiful relationship with her--that's amazing to me. Also, her absolute, unwavering determination to go to school and better her lot in life, no matter what sacrifices she had to make. How inspiring! The plot slowed down considerably once Elnora and her mother mended their relationship. There's a whole lot of moth catching with "we can only be friends" Philip, before it finally came about for him and Elnora to get some romance. Enjoyable, but without the edge it had earlier in the book. Also, I'm glad I read Freckles first. You don't need to, but there are several references--particularly toward the beginning of the book that make a lot more sense having read it. Last thing. Is it just me, or do a lot of these older novels have characters that work themselves into brain fevers over things? I have never heard of that happening in my lifetime, but it seemed to happen fairly regularly back then, if the books are any indication. Maybe nowadays they would just get a prescription of some sort...? Anyway, seems odd to me. I would recommend it for ages 12 and up. I've read both of these and thoroughly enjoyed them. Though, I agree, it does seem a little bit comical that all of Gene Stratton-Porter's love stories have to go to the hospital. :D Have you read Keeper of the Bees? That one has my heart, because it was the first of hers that I read. Gotta re-read it soon. Glad you stopped by! These are the only two of hers I've read. I'll have to track down Keeper of the Bees!